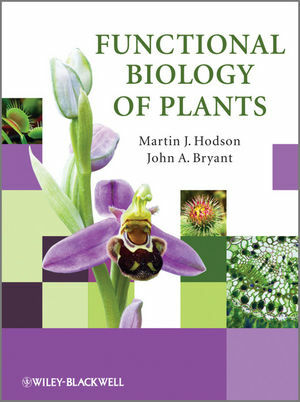 Functional Biology of Plants provides students and researchers with a clearly written, well structured whole plant physiology text. Early in the text, it provides essential information on molecular and cellular processes so that the reader can understand how they are integrated into the development and function of the plant at whole-plant level. Thus, this beautifully illustrated book, presents a modern, applied integration of whole plant and molecular approaches to the study of plants. It is divided into four parts: Part 1: Genes and Cells, looks at the origins of plants, cell structure, biochemical processes and genes and development. Part 2: The Functioning Plant, describes the structure and function of roots, stems, leaves, flowers and seed and fruit development. Part 3: Interactions and Adaptations, examines environmental and biotic stresses and how plants adapt and acclimatise to these conditions. Part 4: Future Directions, illustrates the great importance of plant research by looking at some well chosen, topical examples such as GM crops, biomass and bio-fuels, loss of plant biodiversity and the question of how to feed the planet. Throughout the book there are text boxes to illustrate particular aspects of how humans make use of plants, and a comprehensive glossary proves invaluable to those coming to the subject from other areas of life science. Dr Martin J. Hodson, School of Biological & Molecular Sciences, Oxford Brookes University. Martin Hodson is a Visiting Researcher in Environmental Biology in the School of Life Sciences at Oxford Brookes University. Professor John A. Bryant, Emeritus Professor, School of Biosciences, University of Exeter. John Bryant is Professor Emeritus of Cell and Molecular Biology at the University of Exeter; Visiting Professor in Molecular Biology at West Virginia State University, USA; Chair of Christians in Science and is a past President of the Society for Experimental Biology.